I have been legally blind all my life due to a condition called Retinitis pigmentosa. I have no central or detail vision and see shapes and shadows from my peripheral. I use a long white cane, read Braille, use a computer with a screen reader and do most things non-visually. I am 43 years old and a single mother of two boys, age 9 and 13. I have always viewed my blindness as a positive characteristic, one that has afforded me many experiences and adventures I never would have encountered as a sighted person. Society tends to view blindness as a hardship, an insurmountable obstacle that makes life difficult and limited. Without adequate training and opportunity, blindness can be extremely hard, but this difficulty is not necessarily innate to blindness itself; instead the majority of obstacles stem from society’s attitude towards blindness. Most challenges I experience as a blind person do not come from lack of sight, but instead result from the misinformation and misconceptions about blindness – the attitudes of people, often well-meaning, who do not understand my capabilities. The other day I was walking down the street with a blind friend. We chatted enthusiastically and laughed as we walked. A stranger saw us and said we were “amazing.” Then shortly after, another stranger said he felt “sad” for us. A man in my neighbourhood saw me on my way home from the mall. Despite my quick, confident walk and smile, he asked if I knew where I was going. Since I showed no sign of confusion, he determined I was lost based on my lack of sight. An acquaintance recently expressed disbelief that I was a mother because I was blind. This person did not see me as a competent person; instead she saw inability based on misconceptions about blindness. The public often views us as pitiable or possessing miracle powers, with no in between, without regular traits like anyone else. They view our lives as unlike the lives of others, others who have ups and downs, twists and turns, successes and failures. People who glimpse me on the street and make assumptions about my life do not know that I have children, a university degree, run an organization, swim and ski and date and watch TV and do the dishes and make beds and wear makeup and use a computer and cry and laugh and get angry and feel joy. I experience these things like other people do. This complexity of activities, sensations, feelings and knowledge that make up my life represent independent living. Yes, I live independently in my own home and am in charge of my own affairs, but my diverse and dynamic experience of life truly symbolizes the core of independence. Independence means to live one’s life with choice, with purpose, with self-initiation and self-determination. My unending belief in the abilities of blind people and in the abilities of people with disabilities in general lead me to a career dedicated to advocacy, mentorship and empowerment. As a student at the University of Victoria, I became president of the Society for Students with Disabilities. Subsequently, I served as president of the Canadian Federation of the Blind. 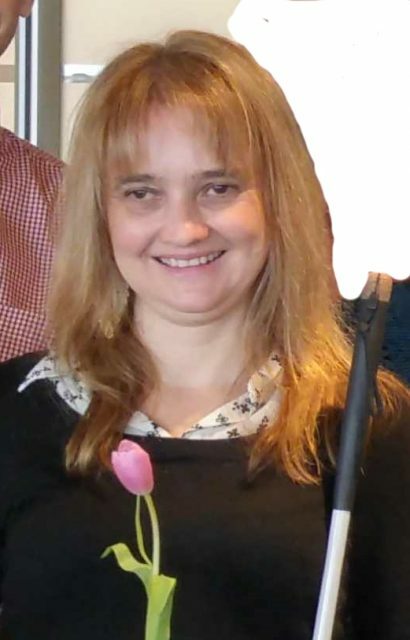 In 2010, I trained at the Louisiana Centre for the Blind, and in 2011, I founded the Pacific Training Centre for the Blind, where I currently work as an instructor and executive director. The Pacific Training Centre for the Blind uses an empowering, problem-solving model of instruction, where blind people are the teachers, planners, directors and administrators. The Center’s main program, Blind People in Charge, involves a collaborative, positive, and empowering approach to blindness, in which blind people learn from and teach each other in a supportive, can-do atmosphere. The program teaches Braille, cane travel, talking computer technology, job readiness, cooking and other lifeskills, but most importantly, students learn to live independently, to raise expectations and to take charge of their own lives. For the last year, I have been honoured to serve on the board of the Disability Alliance of BC. Through this and other roles, I will continue to empower people with disabilities to achieve independence and liberty and to make choices about their own lives. I will continue to find opportunities to spread awareness about the tremendous diversity, experience and potential of people with disabilities.